The Bill & Melinda Gates, Eli and Edythe Broad, and W.K. Kellogg foundations* are putting a combined $7 million behind a product that hopes to answer a key question about free, online education content: What works? PowerMyLearning.com, a K-12 learning platform from CFY, a nonprofit in New York City focused on digital learning for low-income communities, is trying to answer that question. Currently, PowerMyLearning aggregates free education content—video, interactive lessons, and instructional tools meeting Common Core standards— from around the web. 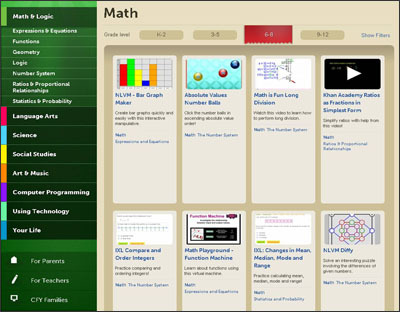 There are three different dashboards, one each for teachers, students, and parents. Teachers can pull together content based on topic areas or skills and create lessons (or “playlists”) for students to use in class, for homework, or in after school programs. So for a science lesson, for instance, a teacher could use a Khan Academy video, followed by a video from Bill Nye, followed by a game, followed by a quiz. 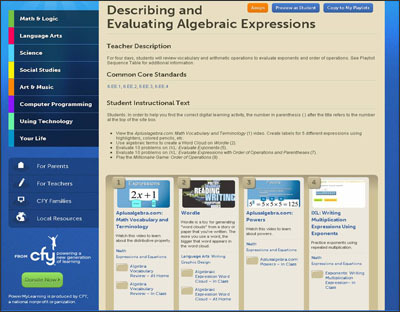 The students can access all of the content through the Web, and parents can log in to monitor their child’s progress. The site, which launched in October, gets about 500,000 page views per month, according to CFY. That’s all fine and good. But there’s a boatload of free, online education content out there and little information on what’s most effective, said Elisabeth Stock, CFY’s co-founder. Even with Khan Academy, a renowned source of free instructional videos that recently got the 60 Minutes treatment, there’s debate over how much students can learn from it. CFY wants to develop a Yelp- or Amazon-style ratings system for education, where PowerMyLearning users can rate the content and playlists they use to make the good content and tools easier to find. The initiative also wants to beef up its data collection on students, using all the inputs individual users give to the software to determine their strengths and weaknesses. There are plans to conduct more formal predictive testing of users, too. This isn’t the first effort to determine the efficacy of digital learning. There’s the federal What Works Clearinghouse, which aggregates data and research on education initiatives and technology. But the clearinghouse still adheres to older, slower models of research that don’t take full advantage of technology, Stock said. Companies such as Knewton, LearnZillion, and EdSurge offer data analysis, instructional content platforms, and product reviews, respectively, but none have pulled all those elements together, and done it for teachers, students, and parents. Notice who I haven’t mentioned yet? Districts. They provide teachers with course materials and technology that costs a lot of money. And couldn’t they do more with student data than an individual teacher or parent? CFY has developed relationships with about 100 schools and their districts. PowerMyLearning can be incorporated into those programs, Stock said. CFY is even considering a dashboard for administrators in the future, she said. But overall, Stock stressed that PowerMyLearning isn’t meant to replace or undermine districts and the content and tools they already use. “Even if school districts are purchasing subscriptions, when a teacher goes into the classroom and closes their door, it’s their domain,” Stock said. “They may be using [the subscription content], but they might supplement it with something that makes it better. *The Gates Foundation provides grant support for Education Week‘s coverage of K-12 business and innovation.